Despite the lovely photo which was taken on our Mexican Holiday - it is cold and rainy in Northern California. That makes it a perfect time for gloves! Here are the beaded, fingerless "gloves" I made for my Mom for Christmas. They are the same pattern as I used for Horsey Girl I just cast on more stitches and knit more rows. This was the first time I ever knit with beads and while they are a bit of a pain, in general I liked it and I like the result. Mom seems to like them (or at least she claims she does)! 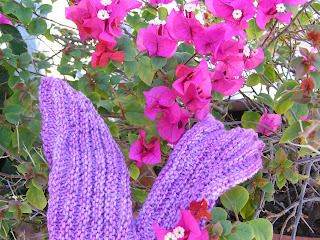 Now I have a pattern for a pretty beaded scarf which I plan to get to one of these days! The gloves are beautiful. I love the beads! I've never knit with beads before.